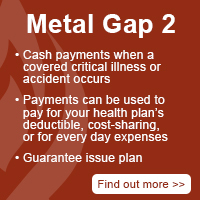 ​and other accident- and illness-related costs. After you're injured in an accident, or when you're critically ill, you don’t want to worry about bills. Even if you have health insurance, there can be holes in your insurance coverage that won’t take care of high deductibles or out-of-pocket costs in the event of a major claim. With Supplemental insurance plans you receive a lump sum payment which helps you pay your deductible, coinsurance, copay and any household expenses. Use your lump sum payment to pay any expenses, from deductibles, coinsurance and copay's to mortgage and car payments, lost wages, daycare costs, credit card balances, even groceries.